At Mobile Transport Repair, it is our goal to rise above; to be the best at what we do. Through communication and friendly, honest work, we strive to deliver. There is nothing greater for us at MTR, than a completely satisfied and happy customer. We are family and you have found a home. Through growth we create stability, and with stability MTR will enable all of us, our employees and customers alike, to succeed in abundance and to have happy fulfilling life. MTR has been a model fleet maintenance business for over 18 years, serving Colorado Springs area with truck & trailer repair. Incorporated in 1996 as Mobile Trailer Repair, MTR has since expanded its scope of service and operations to include our new 9,000-sq.-ft. repair facility. 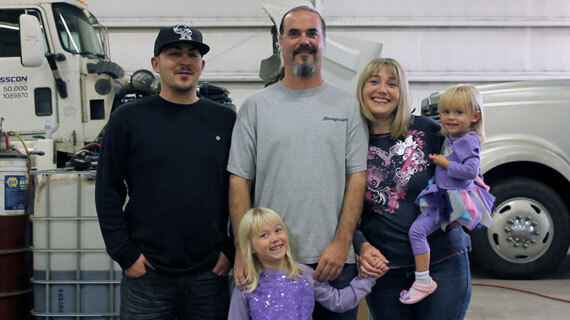 Our highly skilled team of management personnel and certified technicians aim to exceed customer expectations with the kind of personalized service that is rarely offered in today's truck repair climate. Over the years, we've put together a customized fleet maintenance and management program that tailors to each company's needs. Each of our fleets represents a different type of business. For example, our fleet that hauls cement walls for buildings and parking structures has an entirely different fleet management program than the fleet that hauls recycled tires. With each fleet, we have a customized program which includes fleet management, preventative maintenance, and custom, in-house service. By "in-house," we mean that if a customer has a service need that's particular to that company, MTR has performed, maintained, and secured that service need for that customer. With an emphasis on safety, our big truck repair shop strives for perfect safety ratings, and we can perform simple safety modification upgrades to a fleet that aren't currently in place. MTR meets all the business requirements needed for company compliance and makes sure that only necessary repairs are carried out by our technicians. This eliminates extra work that could drive up costs for you. Proper maintenance management also helps avoid these occurrences by keeping your fleet in optimal working order. Eddie and Holly are longtime Colorado residents. Eddie started MTR with a mobile truck. As the demand for business grew Eddie took the opportunity to open a shop. Eddie and Holly love being able to provide for their employees and create a great working environment. Their favorite things are spending quality time with their children, camping and simply appreciating each day. Even though she was born in Indiana, Tammy has called Colorado home for 37 years. Tammy is a busy mom of two active daughters that she enjoys spending time with. Tammy was MTR's part time bookkeeper for seven years and now has taken on a more permanent position as office manager. Wendy is an administrative assistant for MTR. A graduate of Oklahoma State University, Wendy has lived in Colorado for 22 years. Wendy is a mother to one amazing son and enjoys spending her free time with friends. Wendy joined MTR in August 2016. Mike is a service advisor for MTR. Born in Colorado Springs, Mike grew up and graduated in Canyon City in 1974. After living in Northern Colorado and Wyoming Mike now resides in Penrose with his beautiful Christian wife, Jody. He has 3 children and 3 grandchildren. Mike and his wife love to go fishing and spend time together. Kevin is a service advisor with MTR. Kevin has worked in the trucking industry for 11 years and driven trucks for 20 plus. He is married with 2 grown kids. Kevin moved to Colorado Springs in June 2016. Hunting and trying to fly model planes are a few of the hobbies Kevin enjoys. Adam is a diesel mechanic at MTR. Adam was born in Wichita and moved to California in 1962. After coming to visit family, he moved Colorado Springs in 2013. Adam loves fishing, camping, bowling, karaoke and watching sports. He started doing diesel mechanics in 2009. Adam has a positive attitude, is outgoing and spontaneous! A long-time resident in Colorado, Scott graduated from Dohorty High School. Scott served 4 years in the U.S. Army as a 44B metal worker with the 3rd Armored Calvary Regiment. Since, he has worked primarily in the mechanical and transport industry as a fabricator/welder. With 15 years of experience, over 4 years has been here with MTR. Dillon was born and raised in Grand Junction, Colorado. After high school he moved to Montana to work on an oil rig. After being laid off he decided to attend school at Wyotech and study diesel mechanics. He then moved to Colorado Springs to find work. Dillion enjoys being outside, hiking, biking, rafting, and snowboarding. Ramon has been married to his beautiful wife Antonette for 20 years. He has 4 children and 4 grandchildren. A Colorado native, Ramon is a die hard Broncos fan and represents anything Colorado. His hobbies include hanging out with his kids and grandkids, lifting weights, and working on his bikes and 64 Impala! Josh is a lead technician at MTR. Josh has served our country in the U.S. Army for 13 years as a mechanic and special forces operator. He retired in 2012 and returned to heavy duty diesel mechanics. Originally from Dixon, Kentucky Josh moved to Fort Carson in 2000. Josh likes to hunt, fish and modify and design new parts that work better. His goal is to strive to be better. Eric has been technician with MTR since 2011. He enjoys movies, motorcycles and meat. His strange sense of humor and his big heart add a lot to MTR.